The World Trade Organisation (WTO) has ruled that the European Union paid billions of dollars in illegal subsidies to Airbus. The US Trade Representative (USTR) said the ruling opens the way for placing tariffs on EU goods. 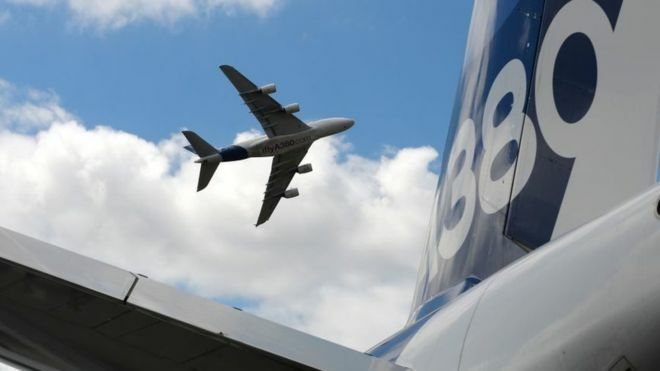 The WTO dismissed an appeal by Airbus saying the European plane maker had failed to fix the harm done to Boeing. The USTR argued that European countries had given $22bn in state aid to Airbus to help launch its A380 and A350 jets. Airbus has a similar case against Boeing awaiting a ruling from the WTO. The accusations, rulings and appeals have been going on for 14 years. Boeing chairman and chief executive Dennis Muilenburg said: "Today's final ruling sends a clear message: disregard for the rules and illegal subsidies are not tolerated,"
Airbus chief executive Tom Enders said: "Of course, today's report is really only half the story - the other half coming out later this year will rule strongly on Boeing's subsidies and we'll see then where the balance lies."